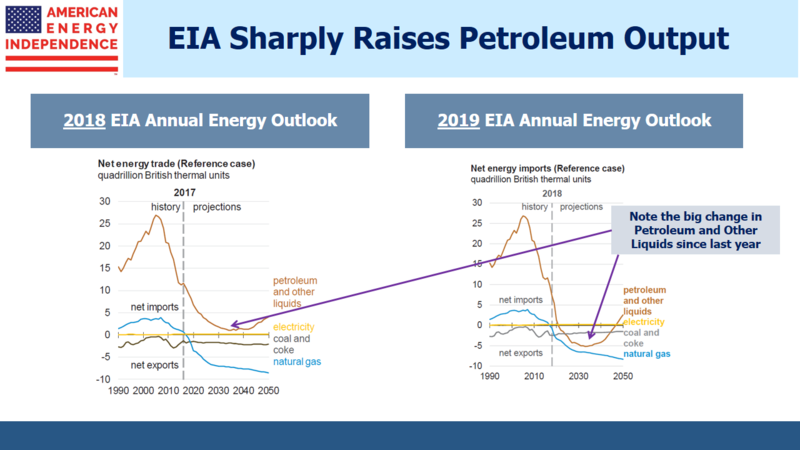 The U.S. Energy Information Administration (EIA) recently published their 2019 Annual Energy Outlook. Whenever your optimism on the prospects for U.S. energy infrastructure waivers, this will restore your confidence. The outlook for domestic energy production is bullish, and in many cases more so than a year ago. 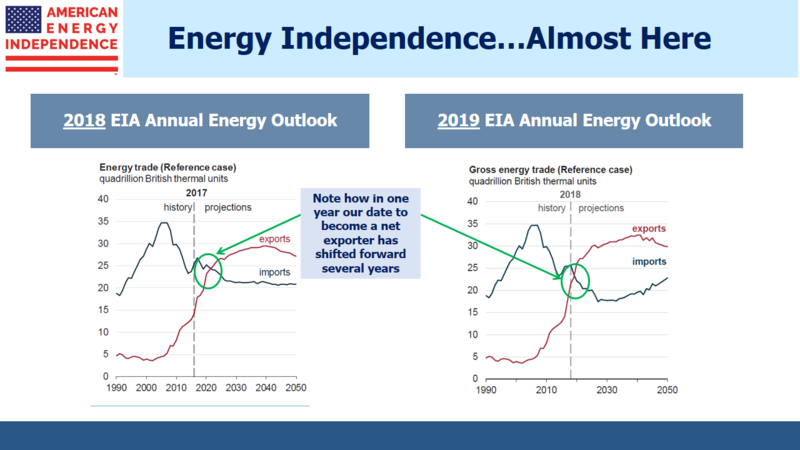 For example, in their 2018 report, the EIA’s Reference Case projected that the U.S. would eventually become a net energy exporter. Now, thanks to stronger crude and liquids production, they expect that milestone to be reached next year. The expected improvement in America’s balance of trade in liquids is dramatic, especially compared with last year’s report. It’s equivalent to an additional 2.5-3.0 Million Barrels per Day (MMB/D) of output. 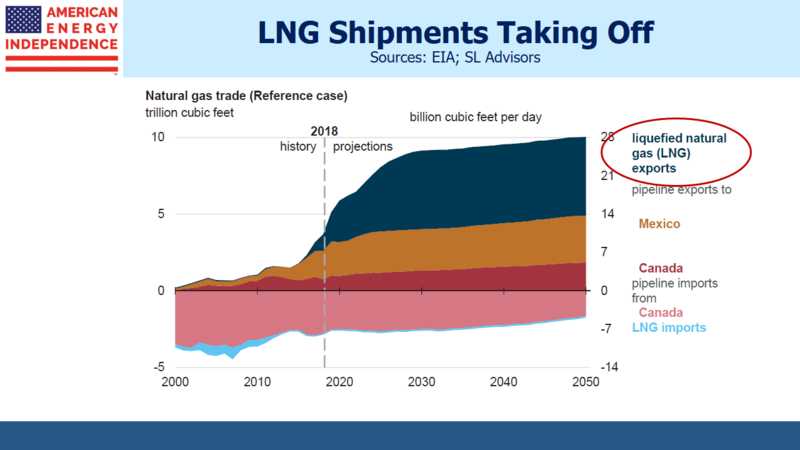 Liquified Natural Gas (LNG) exports are also set to jump sharply, and overall natural gas exports are projected to more than double over the next decade. This is driven by growing Permian crude output, which comes with natural gas as an associated product from oil wells. It’s why flaring is common today, because the needed takeaway infrastructure for natural gas remains insufficient. Mexico’s own infrastructure to import natural gas for electricity generation is still being developed, and new LNG export facilities will provide further demand. The middle chart in the panel below highlights the correlation of natural gas output with the price of crude oil. 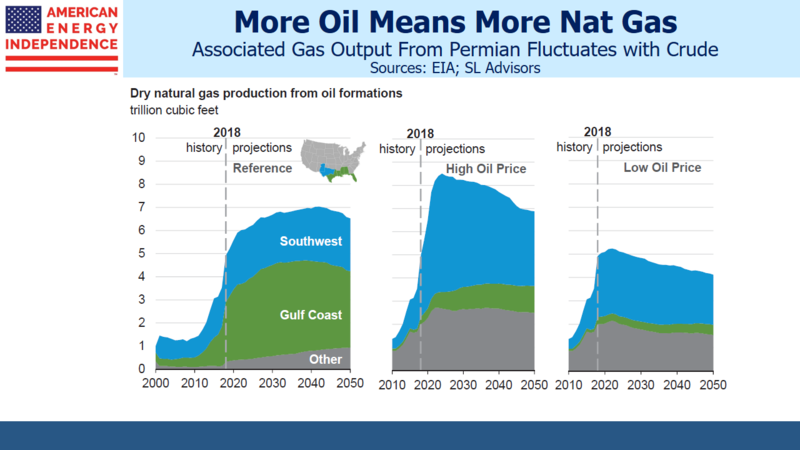 This is because the EIA assumes that higher crude prices will stimulate more Permian oil production, producing more associated natural gas. Although use of renewables to generate electricity will grow, they’re still expected to provide less than one third of all electricity even in 30 years. Almost all the growth will be in solar, which works best in southern states that receive more sun. Although my state, New Jersey, is subsidizing residential solar roof panels, they’re not much use in winter. This is especially so because electricity demand generally peaks twice a day, around breakfast and dinner, when people are leaving for work/school or returning home. At this time of year in the northeast, it’s dark during both peak periods. Only half the days are even partly sunny, with cloud cover rendering solar ineffective on the rest.